Hello everyone, we are experiencing a huge snowfall here with no signs of stopping (we’ve had about 4 feet in two weeks!) and my internet keeps acting up. I’m hoping it doesn’t interfere with Menu Plan Monday today. It is definitely interfering with my ability to answer emails though so if you are waiting on a reply from me I haven’t forgotten and am hoping to get to it soon. Sorry! Feta Stuffed Chicken – this dish was fairly easy to make and fun to get your aggression out smashing flattening the chicken 🙂 Everyone enjoyed it and I’ll definitely make it again. Let’s talk gluten free for a minute. I know many of you who follow or participate in MPM are also cooking gluten free either for celiac or allergy reasons. My son is allergic to gluten and so most nights I’m usually doing a modification of our meal for him (he also can’t eat dairy, eggs or fish). I’ve been doing it for nine years now so it’s really become second nature to us as it has for many other gluten sufferers. But what happens if you don’t have to deal with gluten avoidance everyday but suddenly find yourself with a friend with celiacs that you’d like to have over for dinner? Cathy from the Strawberries are Gluten Free blog has written an article to help you called “So You Wanna Cook For The Celiac” that will provide you with some great pointers to get you started. She also has many great recipes on her site as well that you might want to check out. Oh and I just saw that she is also doing a giveaway as well for a recipe organizer here! I have always said (and will continue to say because I’m annoying like that) that menu planning is an EXCELLENT place to start in your organizational journey. So if you are on the fence about it why not try it for one week and see how it goes. I promise you menu planning is easy once you get the hang of it and the benefits far outweigh any of the reasons for not doing it standing in your way. But just in case you need another little nudge, next week I’ll be hosting another menu planning resource giveaway that looks super fantastic and will surely help you in your menu planning endeavors. The catch? You’ll have to participate in next week’s MPM to be eligible. Think about it, get your mind around it and then come back and link up next week with all the other wonderful ladies that participate here week after week! You gals are the best! Okay with all the snow going on out their in my neck of the woods (which is really in the middle of NOWHERE!) I’ve got comfort food on the brain. Lucky for me I picked up Taste of Home’s Comfort Food DIET Cookbook last year so many of my recipes today are taken from there. I can’t find the cookbook on their site any longer but I was able to find the recipe links below. What a yummy week. Those bagel melts sound totally delicious. You’ve got a great menu! Thanks for always getting me back on track. When I stray and start eating out (because I didn’t plan a menu – go figure), your site always motivates me to plan and be successful at cooking at home. Yeah we’re getting a real pile of snow…I’m hoping for a snow day tomorrow (still not ready to go back to school)!! Sorry to hear about all the snowfall 🙁 At least you’ll be eating some yummy meals this week!!! The Menu looks great, especially with the snow fall. Menu planning has become essential for me! It really has helped me save more $$ at the store. Thanks for hosting MPM! Be careful with all that snow. I certainly don’t envy you. I am so glad the holiday season is behind us, now I can get back into the swing of things and get my routine going again. Thanks for the Menu Plan Monday meme…it really does help me keep on track and save money! i’ve been reading for a while, but rarely comment. i already try to plan my menus at home, but i need new ideas. especially lite/diet ones! the chicken you have planned for tuesday looks so yummy (and good for me!) i’ll be joining MPM next week!!! Oops, I used the wrong “name” for my link. It’s says Jernnifer @ cooking like a frugalite – meatloaf. It should say Jennifer @ cooking like a frugalite – lots of recipes and reviews. So sorry!!! Thanks for another great week! The sweet and tangy pot roast looks like something I may have to be trying soon! Everything sounds so delish! Bagel Melts … genius! I have a couple rolls of bagels in the freezer that could stand to be used up. They’re not so great as breakfast bagels, but as melts … perhaps. Thanks for the idea! We’ve got more snow than ever, too. Our family is actually eating from the freezer this week, exhausting my supply of meals from my meal swapping group. Oh, and if you like to cook, maybe you like aprons? I’m hosting an apron swap and would love it if you could join us!! I never realized you guys were GF/DF…In October the Dr. put my son on a GF/CF diet…At first it was really overwhelming, until I found so many blogs w/ menu’s which has been a lifesaver for me! I’m determined to get back into this as I know that it will seriously help me to keep my goals of losing weight, eating healthy and saving money to pay off debt. Yikes! That’s a lot of snow!! I’m not a fan of tons of snow, but I wish we’d have a little…here in PA where I’m at we’ve barely seen the white stuff this year…it’d just be nice to see it for a day or two! 🙂 Visit my blog this week…I’ll be posting a giveaway in the next few days! Thanks for posting this each week! It has made me become more organized with cooking, and I’ve gotten some great new recipes too. That pot roast recipe sounds great! Looks like we are going to get a similar pile of snow this week. I’m adding my post in for Menu Monday for the first time this week. Hope to be a regular soon! The holidays are over and I am ready to get back on my normal plan – starting with menu planning! I love the Tomato Bacon Bagel Melts and have added them to our menu this week. Most of all, Laura, you would be so proud of me!! Come check out my cabinet reorganization before and after pictures. I took them just for you. We’re not getting snow. Only freezing rain! So I think we’re stuck inside, too. This year one of my New Year’s goals is to reduce the amount of canned foods we eat and rely on fresh! Want to join me? The southwest lasagna rollups look awesome!!! I am saving that link. Enjoy the snow! More great ideas for me to use. Thanks for the link to the chicken recipe. Yum! And I really appreciate the gluten free links, too. I have a friend who has Celiacs and it’s hard for her to eat out at others’ houses. I’ve been meaning to have her over for dinner and it will be a nice treat for her not to have to worry about what’s in the food. With the cold weather we crave comfort food too. Those bagels look yummy! Like my kids would actually eat them! I’ll have to try those soon. This is such a great resource you have built up. Thank you so much for allowing me to contribute. I’m an organizing junkie too so I just love your way of thinking! 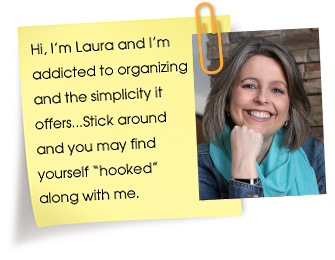 Laura–your recipes sound especially tasty this week! I will be grabbing some of them for next week! I can relate to all the crazy snow! We’re at 70 inches since the middle of December. School still canceled today as another 8 inches expected to fall throughout the day. Those southwest lasagna rolls look yummy. I’m going to give them a try soon. Thanks for the motivation to keep planning meals. One of my resolutions is to menu plan with you every week. Thank you for hosting this! Today was my first day to participate. Looking forward to many, many more! Your menu looks great. I’m glad to get back to menu planning. I took the last two weeks off with the holidays (traveling, eating at families houses and leftovers there just wasn’t much cooking going on here) so it’s nice to get back into the groove. But I found I’m just tired of food now. I’m not really tired of planning, just tired of thinking about food in general. It’s an odd feeling – it’s hard to explain because it’s not even that we’ve been eating that much rich food or even that I’m focused a lot on my diet. *shrug* I think I’m just over stimulated with the amount of food that has been around and ready to get back to simpler stuff. Who knows? Good luck with your weather. We’re waiting to see if we get ice tonight (not much we hope, they’re only calling for up to 0.25 of an inch). Thanks for the link up! I love getting/sharing menu ideas!!! Sounds so yummy! You’re my inspiration to start cooking more like I used to. Good luck with your internet. Hope you get to enjoy the snow!! Stay warm! Thanks for the cooking for a celiac links. I have two girls I teach in my Sunday School class who can’t have gluten and I’m trying to branch out from cooking from mixes for treats to have during class. Those Lasagna Rolls sound yummy! I love this idea and love all the great menus and recipes I have been given. Thanks! Your menu looks great! I love the idea of doing a left over buffet! The lasagna rolls sound great! I might give those a try next week. Thank you for mentioning the Taste of Home cook book, I bought that last year and it is good to know that many of those recipes are also on their website. I am working on getting more organized by doing menu planning, I know that in the end it will be worth it. Once I get this going again I can begin working on making freezer meals for occasions when I’m not able to do the cooking or need to help provide a meal to a family in church for some reason. The family and I just worked on our first meal plan in years last night. We just worked on breakfast and lunch, and never got to dinner. This will definitely help me with ideas for this week. Thanks! I’ve been wanting to make black bean soup… maybe I will try that recipe. I’ve been trying to think of things I can easily freeze and bring lunch-sized portions to work. The bacon bagels sound great, I may have to try making a version that I can eat! Such a good feeling knowing what’s for supper for the rest of the week. I always plan for leftovers as they are used for lunches when Ramen noodles, hot dogs, corn dogs or taquitoes don’t “sound good”! Thanks for coming up with this wonderful idea! I’ve done my first MPM!! Yay! mine’s up…put it on my sidebar! Your menu looks awesome! I’ve been visiting for a while now and figured I should start planning myself. Now hopefully no wrench gets thrown in my plans!!! This is my first MPM and I LOVE all of the ideas! You ladies are amazing. I’m actually putting my menu together tomorow… I was sick all day and am just now feeling a little better. So stop by my blog and check it out tomorrow (tuesday). Thanks for the great motivation!!! This week I started by posting my menu plan on my other blog instead of Angie Rambles. My first menu plan ever! Better late than never. One of my resolutions was to get back to planning meals, and posting them. Almost didn’t make it on the very first Monday of the year! I’m excited to participate for the first time! Can’t wait to get some great menu ideas from you ladies. I had a question for you about your son. How did you know that he was allergic to milk and gluten? My son (11) has aspergher’s on the autism spectrum and I have begun researching the gluten free/casein free diets. I was wondering if there was a way to find out for sure before changing our family diet. So, I thought I would ask you how you determined it for your son. Thanks so much — I LOVE your blog!! Guess what! Just picked up the new TOH Comfort Food diet cookbook for 2009 at Target yesterday. 🙂 More Post-It Note tape flags. You blog has given me a much need spark. To get my clutter under control.